According to European and international standards relating to illumination of roads and tunnels, validating lighting levels is mandatory for safety purposes. 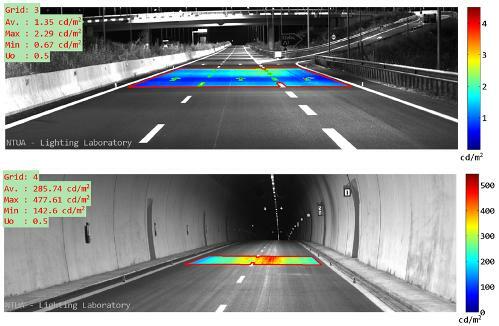 As part of my PhD, I developed an imaging system that measures road surface luminance in real time. The system was designed so that motorway operators, motorway maintenance service providers, and engineering companies can gather data to ensure road and tunnel lighting adheres to the standards. The system has been used to validate lighting in more than 60 road tunnels and tens of road interchanges around Greece and the Balkan countries, and further projects are being negotiated in other countries. The results were used to support the official delivery of lighting installations, or to redefine and reschedule maintenance plans for lighting equipment. The device was developed using machine vision technology and specialised image processing techniques. It can be installed on any vehicle without modification. The images are recorded as the vehicle moves through the tunnel at normal driving speeds (around 40-60km/h). Several images are captured resulting in a full scan of the tunnel or road section. The system adapts to changing illumination levels, especially in tunnel lighting, ensuring accurate measurements throughout the dynamic range of the imaging system. The results and the quality indices can be exported in real time, and it takes less than a minute for each tunnel pass-through. The equipment traditionally used for collecting this data is time-consuming to operate and designed mainly for laboratory measurements, limiting their use to external field tests. This work would also normally require partial or total interruption of traffic flow while the tests were carried out. Using this mobile system, measurements are made without interrupting the traffic. 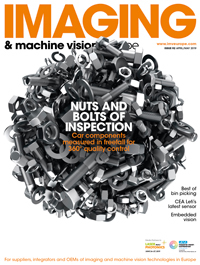 The imaging sub-system is based on an Allied Vision Prosilica GE GigE camera equipped with a full frame On Semiconductor sensor. The system uses an electronic EF-mount lens connected to the camera with a special electronic mount. It is calibrated to measure photometric quantity candela per square meter (cd/m2) against a standard and traceable luminance source. The photometric calibration includes some advanced techniques to eliminate lens vignetting, dark signal treatment, and other unwanted aberrations. A dedicated software suite was developed to control the system and process the images. It includes image processing algorithms to locate and extract the region of interest (ROI) on the road surface relating to the quantity and quality photometric indices. Image processing incorporates lane detection and extraction, image transformation and image analysis according to the relevant standards. Analysis can be performed both manually and automatically. For tunnels, where the lighting system consists of several luminaire groups and several illumination levels, the measurement should be repeated for each lighting level (commonly called lighting stages). The results can be used to validate the lighting installation against the lighting design or to reveal potential operational issues. In many cases, these operational issues cannot be seen by the naked eye. The system offers fast and easy assessment of lighting in tunnels and on roads, providing a tool for users to inspect, maintain and fine-tune these installations.